View cart “One Tribe at a Time” has been added to your cart. Team members during the May 2, 2011, U.S. military raid that killed Osama Bin Laden seized piles of Al Qaeda intelligence. 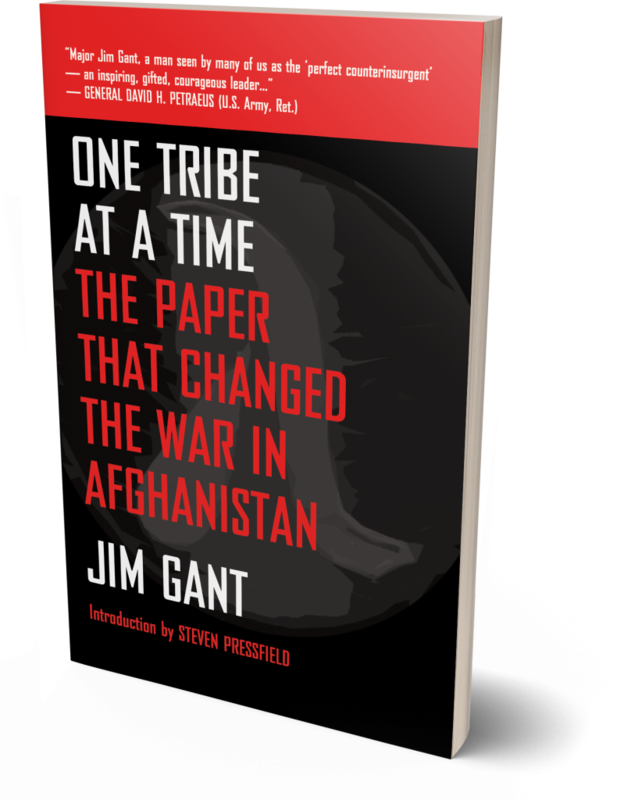 One piece of evidence found in Bin Laden’s personal sleeping quarters was an English language copy of Jim Gant’s One Tribe at a Time. It contained notes in the margins consistent with others identified as written by Osama Bin Laden. A directive from Osama Bin Laden to his intelligence chief was also discovered. It identified Jim Gant by name as an impediment to Al Qaeda’s operational objectives for eastern Afghanistan. Bin Laden ordered that Gant be assassinated. Team members during the May 2, 2011, U.S. military raid that killed Osama Bin Laden seized piles of Al Qaeda intelligence. One piece of evidence found in Bin Laden’s personal sleeping quarters was an English language copy of Jim Gant’s One Tribe at a Time. It contained notes in the margins consistent with others identified as written by Osama Bin Laden. A directive from Osama Bin Laden to his intelligence chief was also discovered. It identified Jim Gant by name as an impediment to Al Qaeda’s operational objectives for eastern Afghanistan. Bin Laden ordered that Gant be assassinated. Jim Gant enlisted in the Army at the age of 19. In 1989 he earned his Green Beret and Special Forces tab, and in 1990 he took part in the first Gulf War as a member of the 5th Special Forces Group. Gant enrolled in college and joined the Reserve Officer Training Corps (ROTC) at New Mexico State University, and was commissioned in the U.S. Army as a 2nd Lieutenant and infantry officer in 1995. He spent two years as an Infantry platoon leader and two additional years as a Scout platoon leader. He was a captain and going through Special Forces training as an officer when terrorists attacked the United States on 9/11. Gant led a Special Forces team, Operational Detachment Alpha (ODA) 316, in Afghanistan’s Konar Province in early 2003. There, he met Pashtun tribal leader Malik Noor Afzhal for the first time. Gant deployed again with his Special Forces team to Helmand Province in 2004 and was then hand-picked to lead a special projects team for the next two years. In 2006, Gant volunteered to go to Iraq. After 14 consecutive months of direct combat in Iraq, Gant returned to the U.S. and became an Unconventional Warfare instructor at Fort Bragg, N.C. In 2009, he wrote the paper “One Tribe at a Time,” which went viral online and throughout the defense establishment. Gant was selected to return to Afghanistan, form an alliance with Malik Noor Afzhal, and together fight the resurgent Taliban in eastern Afghanistan. Gant’s war-time awards include the Silver Star, Iraqi National Police Medal of Honor, and the Army Commendation Medal with V device, and Bronze Star with two oak leaf clusters. He considers his greatest military achievement the fact that the men who fought alongside him were awarded over 20 awards for valor.